Eric Clapton: Life in 12 Bars, Lili Fini Zanuck’s documentary, is a well-intentioned film seeking to understand the complicated life of the British guitarist. But when Zanuck tries to make connections between Clapton’s addictions and his failed relationships while he pursued a career in music, she gets too bogged down in the details and misses the bigger, redemptive picture. Zanuck is best known as a film producer and the wife of the late Richard Zanuck, who died in 2012. She won an Academy Award for producing Driving Miss Daisy in 1989 and she’s directed a few music videos including Clapton’s “Tears In Heaven” and “Pilgrim.” But this is her first full-length documentary, produced for Showtime, which recently made its debut on television. The movie premiered in 2017 at TIFF. Life in 12 Bars uses extensive archival footage culled from hundreds of hours of film, tape and radio broadcasts and quite possibly new interviews, although the new voice-overs are not distinguished from the historical sound files. Perhaps the director had too much material; Clapton approached Zanuck when he was “getting nervous” about all the archival footage that was being collected on his behalf for an anthology. Zanuck, a long-time friend, accepted Clapton’s proposal to make a feature-length documentary using this collection. Clapton appears only at the beginning of the picture, lamenting the death of B.B. King. 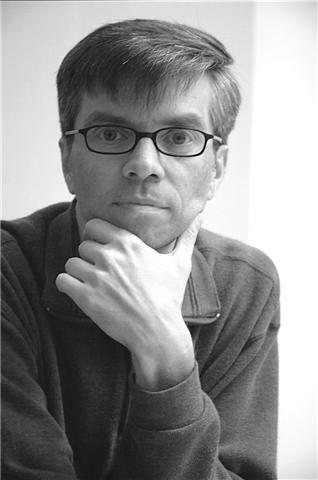 After that, he’s seen only in photographs and archival footage. It’s the same with all the other musicians, friends and family members who talk about their relationship with him. They, too, are seen in vintage home movies, photographs and news videos telling the story of Clapton from his birth to his present status as a seasoned musician, parent and recovering addict. The resource material is very good, with plenty of great performances to entertain us over two hours. But while it makes for a good music movie, it’s the context of the various interviews and comments the director has trouble sorting out, allowing herself to wander from time to time instead of using the footage to make a compelling point about her subject. Zanuck does focus on Clapton’s troubled relationship with his mother, Patricia, who had him out of wedlock in 1945. Clapton’s father was a Canadian airman who met her in Ripley during the Second World War. She was fifteen at the time. Since it was a serious social crime to have illegitimate children in those days, Clapton was raised by his mother’s parents, Rose and Jack Clapp, and for a long time understood his real mother to be his sister. Eventually the truth was revealed to young Eric. Shortly after his birth, Clapton’s mother left for Canada and married a soldier by the name of Frank MacDonald, rarely returning to unite with her son. But Clapton says that, in spite of his being spurned by his real mother when he was a boy, his grandparents loved him and nurtured his interest in music. To explore the peculiar relationship of Clapton and his mother, Zanuck chooses two significant and painful memories that he talks about in a voice-over. His mother visited him, first in 1953 and then in 1961, leaving the young man “angry, isolated and lonely.” She and MacDonald treated him like an outsider, going so far as having his hair cut short when he was 16 on a visit to Germany, where MacDonald was stationed. A home movie of that trip is included, showing a shorn Clapton looking very uncomfortable with his family and new haircut. During that same, excruciating visit in 1961, his stepbrother broke the neck of his first guitar, a prized possession of young Clapton's. The incident affected him so deeply that he became distrustful of adults. While this revelation is significant, however, Zanuck fails to explore it further in the movie. 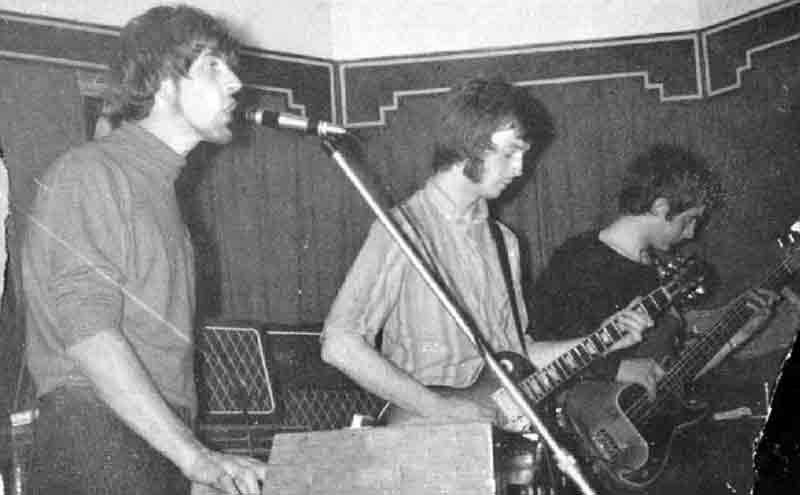 John Mayall, Eric Clapton, and John McVie in November, 1965. In spite of a secretive family history and a cruel mother, Clapton found solace in blues music, which caught his ear on a BBC radio show called Uncle Mac. When he heard Big Bill Broonzy or Robert Johnson singing and playing their guitars, he connected with their solitary sound expressing hardship and personal troubles, which “took all the pain away.” Those voices coming out of the radio offered the troubled Clapton a chance to do the same thing for himself. At the age of 14, he was given his first guitar and spent hours playing along with recordings at home, often at the expense of a good night’s sleep before school. Zanuck’s film tells Clapton’s story chronologically, using vintage television clips and personal photographs from his first band in 1963 called The Roosters to hanging out with The Rolling Stones and The Yardbirds and winding up with John Mayall’s Bluesbreakers in 1965, arguably the premier British blues band of the era. The short time he spent with John Mayall opened several creative doors, including a steady work schedule: Clapton says he played seven days a week, honing his skills as one of England’s best and best-known guitarists. In a voice-over, Roger Waters says that Clapton’s sound and style of playing was full of “character,” something the founder of Pink Floyd claims was missing from the growing pop music scene. 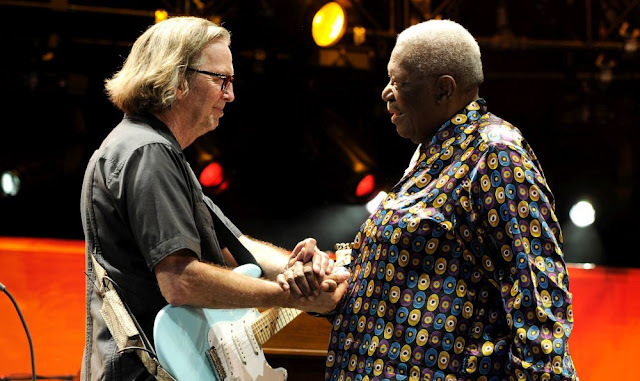 It was at this time that Clapton discovered his sound, which he modeled after the “thick and fat and melodic tone” of blues harmonica player Little Walter. He was able to reproduce that sound on his guitar using Marshall amplifiers, which were big and loud. By 1966, Clapton was gaining a cult following in the British music scene. He was friends with George Harrison and Jimi Hendrix and was often in the company of blues greats B.B. King and Muddy Waters. In the summer of that year, Clapton formed the blues-rock fusion band Cream with Jack Bruce and Ginger Baker. They made big money, toured the world and eventually broke up in 1968 because the close confines of the tour and the high expectations of the critics and fans made them miserable. This was a pivotal moment in Clapton’s life because he was suddenly lost, a man without a band, feeling isolated and alone, similar to how he felt as a child. Once again he recovered through music by forming Blind Faith with Steve Winwood, a blues-based band with a strong spiritual component. The song “Presence of the Lord” was Clapton’s lament for the emotional loss he felt the year before. At this point, the documentary is over an hour into its 135-minute run, which means we know it will take less time to cover the next 40 years of Clapton’s life. As a result the flow of the film begins to stagger. By the time Boyd had left Harrison and hooked up with Clapton a few years later, he had kicked smack by switching to alcohol. His beverage of choice during the seventies was Courvoisier brandy; often he polished off a whole bottle before noon. Boyd couldn’t save him and neither could his bandmates, who put up with his nasty behaviour during recording sessions and follow-up tours. As Clapton describes his seventies recordings, “I can hear how drunk I am” -- in spite of the fact that 461 Ocean Boulevard, released in 1974, is still considered one of his best albums. Once again Zanuck uses archival footage to illustrate these awful years for Clapton’s health. One disturbing scene shows him in post-concert drunkenness, leaning against a wall, clutching a bottle of brandy. He's so loaded taht he collapses on the sidewalk. If that wasn’t enough, Zanuck follows up with an embarrassing home movie of Clapton snorting cocaine from the end of a knife and chasing it down with a beer. He was a mess and he couldn’t climb out of the pit he dug for himself. By 1980, Clapton’s resilience, or what was left of it, found him masking his alcoholism while continuing to perform and record. His relationships with women also suffered until he hooked up with Lory Del Santo, who gave birth to his only son, Conor, in 1986. This life-changing event put Clapton on notice, as it were. As he admits in the film it was “time to grow up” and accept his responsibilities as a parent. 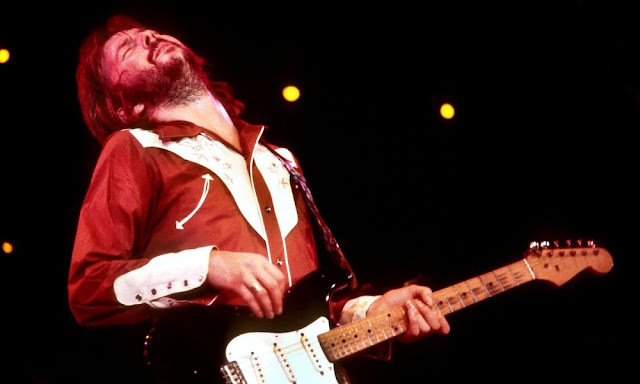 Clapton was 41 years of age but took up the challenge of being a father with gusto and as the film reveals it was good time for him: he finally sought help and got sober in 1987. After several years' absence his newfound sobriety is heard on his 1989 release, Journeyman (Reprise): once again he found solace in the music to chase away his pain. Unfortunately, this important album is another glaring omission in the film, along with another great study the CD box set collection called Crossroads, released the year before. In 1991, in a tragic accident, Clapton’s son Conor died after falling out of a window of the family’s 53rd-floor New York apartment. (Clapton was not home at the time.) As he says, “I couldn’t grasp it” – so he went into exile, not to drink or do drugs, but to play his acoustic guitar and, like his heroes, Robert Johnson and Big Bill Broonzy, wipe the pain away. Inspired by the thousands of cards and letters he received, he wrote his most personal song, “Tears In Heaven,” which made its debut on MTV’s Unplugged. The soundtrack and the single garnered Clapton multiple Grammy awards in 1993, which rejuvenated his life and career. At this point in the film, Zanuck reduces Clapton’s life into point form. He establishes Crossroads, a treatment center for addiction in Antigua, and marries Melia McEnery in 2002. The film closes with home movies of Clapton’s new family of five, including his daughter’s wedding and a tribute from B.B. King, but for me the story doesn’t end there. Zanuck’s documentary ignores Clapton’s important recordings after 1994, which found the singer returning to blues music in a big way. From The Cradle (1994) is one of Clapton’s finest records. His tribute to Robert Johnson on Me and Mr. Johnson, and its excellent companion, Sessions for Robert J released in 2004, are equally good. Clapton also recorded with J.J. Cale and B.B. King, two of his favourite songwriters, but these key albums and what they meant to Clapton, are omitted from the documentary. It’s in these recent recordings we find Clapton coming full circle by embracing the music he loved as a child and performing the songs as a seasoned veteran. As he says in the liner notes to Me and Mr. Johnson: “I accept that it [blues] has always been the keystone of my musical foundation . . . and as a landmark that I navigate by, whenever I feel myself going adrift.” That statement alone says more about the man and his recovery than Eric Clapton: Life in 12 Bars.